GWO Basic Safety Training (BST) course 4 module course (5day course) has been held from January 18 to 22. There has also been BST Sea Survival course (2day course) as one of our past delegate who had taken 4 module course requested to take the rest of module, Sea Survival. It is said that we would be hit by a cold wave in coming weekend, but luckily the training could get out of the severe weather in the nick of time. All delegates were the fortunate! The photo below is a training scene from the Working at Height module during 5day course. The training went on the assumption that “Emergency situation, buddy has become unconscious on the ladder height of 20m. You need to carry him down and transfer to the safe platform”. You may think, “Hey, unconsciousness in 20m height? He must have fallen down to the ground to be injured!” Well, in fact, the worker working at height like this is wearing safety harness with fall arrest system to prevent from fall. He won’t fall down, but the delegate must rescue him as the victim is unconscious and not be able to move by himself. We rescue 30kg dummy from 3m height, but this is much hard work than expected, so I would like everyone working at height should experience this and learn the procedure. Next photo is a scene from Sea Survival. The situation of this training is that the delegate need to evacuate from the nacelle of offshore windfarm into the seawater. 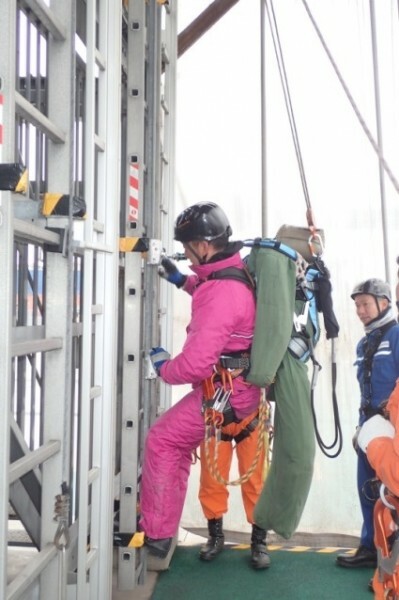 Delegates would emergency descend from 5m height in this training. The delegate was very earnest to get familiar with the evacuation device. We thank all delegates for joining the training. 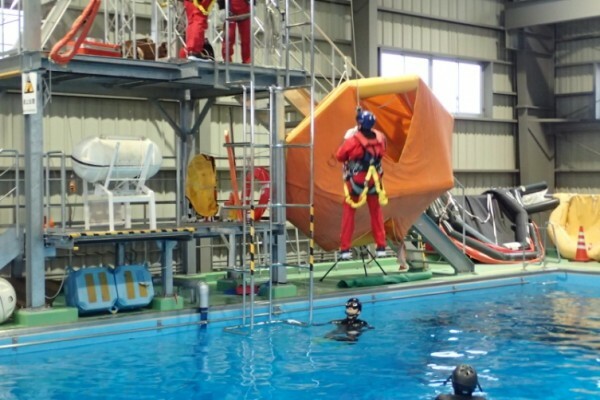 NSTC deliver many kinds of training, and most of them are the training of emergency response. We wish your safety and security not to encounter the situation to perform the evacuation method here in NSTC. Wish you a safe and sound year of 2016. Safety first! !